These are so easy, they require practically no cooking at all — just assembly, really. They’re the perfect make-ahead meal that can be put together on a weekend, minus the sauce and cheese, and then finished off and baked just before dinnertime on a busy weeknight. The brown rice in the filling makes them hearty and helps stretch the chicken a bit to keep this recipe extra budget-friendly. In a medium bowl, combine the chicken, rice, 1/4 cup onion, 3/4 cup shredded cheese, and 1/2 cup chicken stock. Set aside. Combine the remaining 1 1/2 cups chicken stock, 1/2 cup onion, tomato puree, garlic, cinnamon, red pepper flakes, salt, chili powder, cumin, and vinegar in a blender or food processor. Blend until smooth. Pour 3/4 cup of the sauce over the chicken mixture and stir thoroughly to combine. 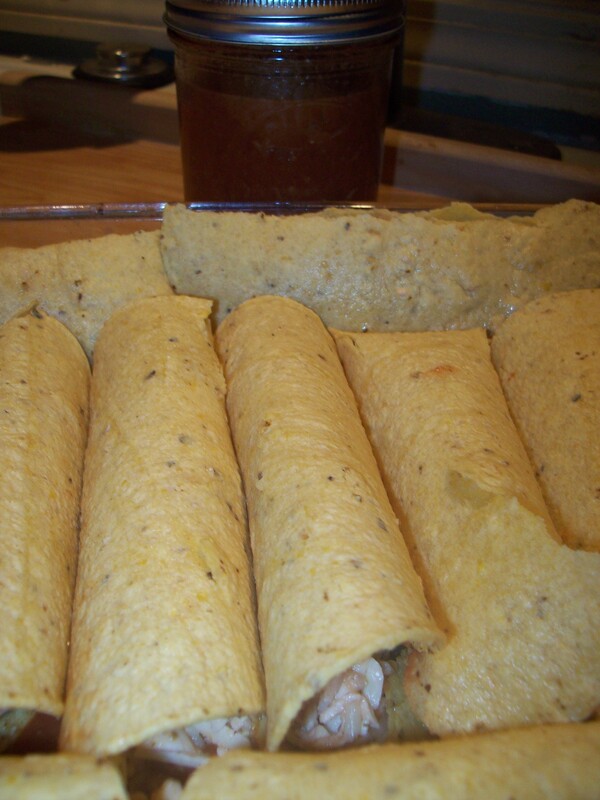 To assemble the enchiladas, spread 1/2 cup sauce in the bottom of a 9×13 casserole dish. Dip a corn tortilla briefly into a dish of warm water to soften it and make it pliable. Top with about 1/4 cup to 1/3 cup of the chicken and rice mixture, roll, and place seam-side down in the dish. Repeat with the remaining tortillas and filling, nestling them tightly against one another in the casserole dish to keep the rolls secure. When ready to bake, preheat oven to 375 degrees. Pour the remaining sauce evenly over the enchiladas, then top with the remaining 1 1/2 cups shredded cheese. Bake, covered, for 20-30 minutes to heat through; remove the covering and bake for an additional 10 minutes until hot and bubbly. Serve with guacamole, refried beans or black beans if you’d like, and corn or salad.